Developing and controlling internal, reliable, (and ideally, clean) energy sources is critical for Afghanistan’s long-term energy security, climate mitigation, and a bright economic future for Afghanistan. According to Afghanistan’s national electricity provider “Da Afghanistan Breshna Sherkat (DABS),” Afghanistan imports about 1,000MW of its supply from Iran, Turkmenistan, Uzbekistan, and Tajikistan. However, outside energy sources can be unreliable. In January, Turkmenistan cut power to remote villages in Northern Afghanistan over a price dispute and demanded a 100 percent price increase. This attempt to force the Afghan government into capitulating failed. The power was rapidly turned back on but it highlighted how important internal energy sources are to Afghan national security. More recently, in June of this year, Iran abruptly reduced the amount of electricity exported to Afghanistan, citing lower water levels in dams due to soaring temperatures. Large hydropower and micro-hydropower stations are effective sources of energy that do not create significant greenhouse gas emissions as coal and oil do. Dams can also make it easier to store water which can be piped to villagers’ homes to provide clean drinking water and be used for irrigation. However, energy sector development of remote regions does not always translate into stability. Once a remote village is electrified it is unclear if it will be more loyal to local tribal leaders, the central government in Kabul, or local insurgent groups. In a study of climate change mitigation and adaptation mechanisms including micro-hydropower stations in remote Nepal, although a project was backed by the government, it did not increase its legitimacy in the eyes of residents. Instead it seemed to strengthen local authorities who were perceived as more directly responsible for the projects as funding was often transferred to them. Disrupting power generation seems to be a recent coercive tactic the Taliban uses particularly when someone tries to negotiate with them. In March of this year, the Taliban blew up several transformers leaving areas of Kabul in total darkness. The reason given was that the government was not electrifying Taliban-held areas fast enough. Hydropower stations have also been a recent Taliban target. The Taliban also attacked the Salma Dam, a large hydroelectric dam, in a remote area of Herat in 2017. The attack occurred after President Ghani called for a return to peace talks. Major hydropower stations such as the Indian-government funded Salma Dam (or Afghan-India Friendship Dam) inaugurated in 2016, have been a critical source of power generation for Afghanistan. The Ministry of Energy and Water has estimated that hydropower could generate more than 23,000 megawatts per year in Afghanistan. India has been a generous donor to the Afghan power sector. Since 2001, India has spent more than US$2 billion on infrastructure projects in Afghanistan including on major feasibility studies for new hydropower stations and repairing damaged stations. India is now funding a new dam known as the Shatoot Dam (also referred to as the Lalandar Dam) for US$300 million. The dam will service Kabul and Dehsabz, a new city rising on the outskirts of Kabul. In more remote areas of the nation, power options are more limited and micro-hydropower stations often are more feasible. In remote Afghanistan, micro-hydropower has been distributed to small villages using “mini-grids,” which are grid systems that distribute from about 10kW to 10MW of electricity. According to USAID, 5,000 mini-grids in remote locations were built and installed between 2003 and 2015. The “mini-grids” can be built and installed rapidly and seem to spark less local opposition than large hydropower stations. An inclusive and transparent process involving local villagers goes a long way towards peacebuilding while developing energy capacity. In Afghanistan, local villagers are often encouraged to feel a sense of ownership in micro-hydropower projects. Communities are encouraged to contribute both financially and through labor in the planning, development, and operations of the micro-hydropower stations. Micro-hydropower offers many advantages. Unlike commodities like coal or oil, micro-hydropower is not subject to market fluctuations making it a more reliable source of energy. Large hydropower stations can have negative impacts such as village disruption or relocation, loss of biodiversity, and an increase in organic materials due to build up from dams. These materials can reduce fish stocks when they decompose, reducing oxygen available. In contrast, micro-hydropower is less likely to force villagers to relocate or cause major negative ecological impacts. Connecting remote villages with micro-hydropower can truly change lives. Electric lights are much safer than polluting and dangerous kerosene lamps. Besides allowing children to study after dark and letting artisans work long into the night thus improving livelihoods, electricity improves communication in the village by powering cell phones and computers. Not surprisingly, electricity supplied via micro-hydropower stations is often cited by locals as the most important project needed in a village. Electricity can often bring a village together and increase loyalty to the local leaders who are seen as responsible for the new electricity. In Afghanistan, this has serious implications in areas far from Kabul’s control. While the government in Kabul may be funding the construction of remote micro-hydro power stations, it has been widely reported that a shadow Taliban government is gaining significant control over many rural areas. And that control may extend to perceptions surrounding who controls the power. Recently, the Taliban seems less interested in violent coercion and more interested in growing its influence by supplying services to local villagers and even collecting energy payments. The Taliban has made inroads, gaining significant control over utilities and communications in 8 of 34 provinces and controls one-quarter of the mobile phone service, according to a report, Life under the Taliban Shadow Government, released this year by the Overseas Development Institute. Where the government does provide services, the Taliban often exerts control in order to be seen as the provider thus expanding its influence. Micro-hydropower projects are critical for electrifying remote areas of Afghanistan but which leadership may benefit remains to be seen. By appearing to provide needed electricity to remote communities, or at least taking credit for new government projects, the Taliban could potentially grow its influence in remote areas, regions the central government in Kabul needs to control to grow as a nation. Elizabeth B. Hessami, J.D., LL.M., is a Visiting Attorney for the Environmental Law Institute researching post-conflict environmental issues in Afghanistan and is also an Adjunct Professor of Environmental Governance for Linfield College and International Environmental Law for The Johns Hopkins University. 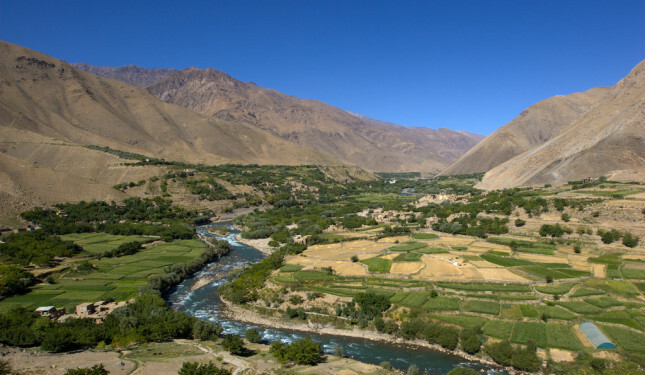 Photo Credit: River and village in Panjshir Province, Afghanistan, May 2011. Courtesy of Abdurahman Warsame.